﻿Your doll will look fabulous in these trendy shorts! They feature lace overlapping fronts and an elastic waist.. 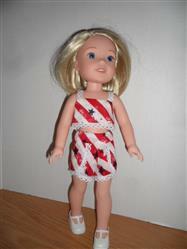 This PDF pattern is designed to fit 14.5" dolls such as WellieWishers™. It's also available at Pixie Faire for 18" dolls such as American Girl®. Recommended Fabrics: light weight woven fabrics, such as chambray, quilting cottons, linen, batiks. Avoid overly stiff lace. -24” of ¼” or ⅜” lace trim, crochet trim or pompom trim. Very cute and easy to make. I have the AG one as well and made 12 AG shorts and now 2 WW shorts. Love it! This is such a cute pattern! It goes together quickly and gives such a cute finished piece for your 14.5" doll's wardrobe. This is a must-have for your pattern library. To difficult for an eight year old to to, in fact my wife had issues with it ! Cute easy pattern. Picture of the first one I made for my Wellie Wishers doll. Any little top would go great with it. Thanks again.